The city of Coquitlam sits at a higher elevation than the rest of Metro Vancouver. This, makes it prone to frost and snow during the winter months. The annual snowfall in Coquitlam is usually around 58cm, however the city and its surrounding area have seen much worse. Over the winter of 2008-9, 175cm of snow fell on Coquitlam resulting in major traffic and flight issues. The point being, we can never be sure just how bad winter will be! It is always better to be prepared with a plan for your Coquitlam snow removal and salting. This is particularly true if you own or manage apartments, a Co-Op, Strata or commercial property. During B.C.’s winter season the number of slips, trip and falls caused by icy conditions rises dramatically with the results ranging from minor cuts and bruises to more serious injuries requiring hospitalisation. 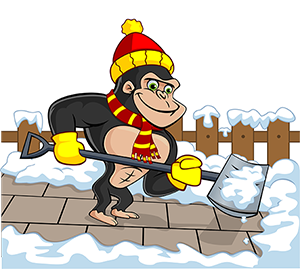 Gorilla Property Services annual Salting and Snow Removal Services allows your Coquitlam residents and/or customers safe access to your property and the surrounding area so you can rest easy. Our fully trained, licensed and professionally uniformed Gorillas carry out the bulk of their salting and snow removal duties while the rest of Coquitlam slumbers. The night before expected frost or snowfall, we sneak in and salt parkade entrances, walkways and landings. On snowy days, before your alarm has even gone off, our silent snow removers have been and gone. The only proof they leave behind is safe common areas, free of any and all traces of snow and ice.